Best guideline: Think about what you would be willing to pay for the item if you were in the buyers shoes and the one considering purchasing it. If you would pay a particular price, someone else probably would, too! Ask yourself: "What would I pay for this?" Also, look at the original retail price and take 75 % off. For example, if an item’s originally cost was $20, take 75% off and price the item in the range of $4.50 to $5.00. If it is an item that is highly desirable like Abercrombie, Polo, Gymboree, Limited Too, etc., you can go up from the 75% off. If it is an item that is still in good shape, but from Target, Walmart, etc. you might need to stay around the lower price. Keep in mind you are competing with many items of similar quality, and the best price will sell first. 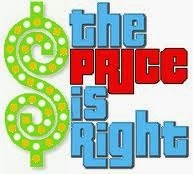 After determining what you think is a fair price, ask yourself, "Would I pay $?? for this item?" or "Would I pay more than this?" If you would pay more, add a dollar or maybe two to the price. The people who make the most money have higher quality items priced in the ranges of $5.00 - $15.00. A few high quality items will really add up quickly! Keep in mind that your goal is to sell your items, otherwise, you will be taking it home with you at the end of this sale, so be careful to not over price.